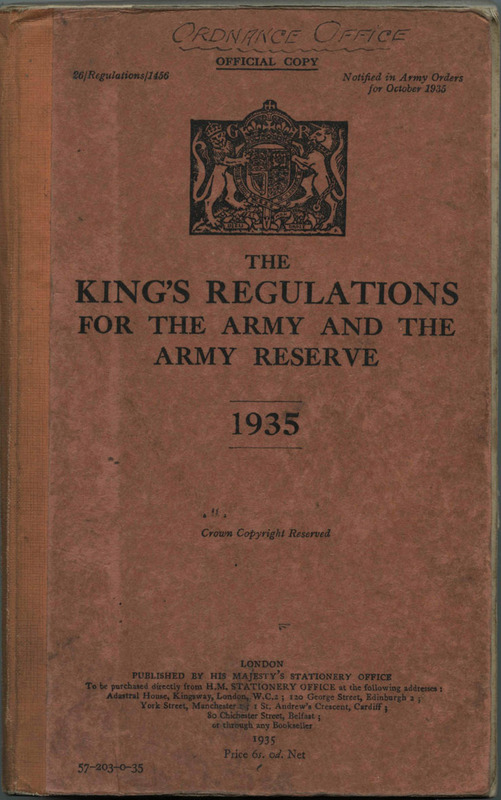 From this page you can view Kings Regulations. We have digitised a 1935 version of the Regulations which was used in an Ordnance Office. It has some annotations reflecting amendments, and also a number of amendments cut out from the relevant Army Order and then pasted into the book. The amendments cover the period up to the end of 1937. If you know the paragraph number of the Regulation, then enter it into the search box and click "Search". A list of pages containing the paragraph number will be displayed - select a page and view the page. Enter a search word in the search box and click "Search". Again, a list of pages containing the search words will be displayed - select a page and view the page.